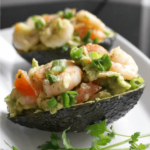 Healthy Avocado Shrimp Salad in avocado skins, a delicious and quick recipe. 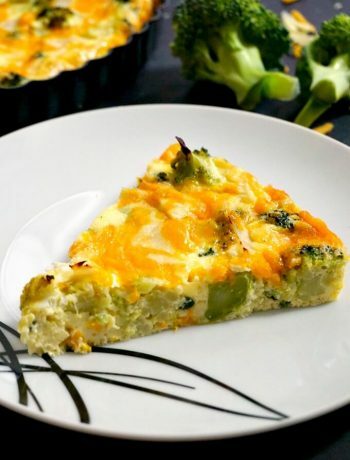 If you are looking for lighter and more nutritious meals after all the heavy winter food, this is a recipe for you. Ready in just about 10 minutes. I don’t know about you, but I feel that this winter has been ridiculously long and cold. I mean, come on, it’s March, what is going on with these low temperatures, heavy winds, and just miserable weather? I need a bit of sunshine in my life! And before we jump from comfort food to all that yummy Easter baking, a nice salad with shrimp, tomatoes and avocados can go down a treat. If you feel strongly about shrimp (and you know who you are!!! 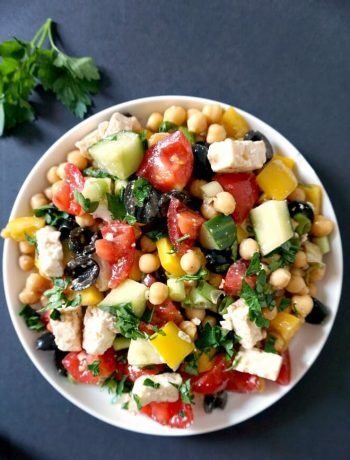 :D), then you might want to forget about shrimp and just make this salad into a quick dip to be enjoyed with tortilla chips, breadsticks, or any flatbread of your choice. Or you can perhaps go for a simple Cucumber Tomato Avocado Feta Salad Recipe, equally delicious and as nutritious. But, if you do like shrimp, the salad is filling enough, and does not really need anything else. I mean, just look at these mouth-watering little things sizzling in that hot pan! The addition of garlic, ginger and spring onions brings extra flavour, I would recommend you not to skip this step. If you don’t mind a bit of a heat, throw in some chilli flakes or even some fresh chilli peppers too. BEST TIP HERE! Do let the shrimp cool down before adding them to the salad, as they will make it warm, and I personally dislike the taste of warm or even room-temperature avocado. Don’t even get me started on the whole baked avocado trend!!! That’s something I could NEVER eat. But hey ho! 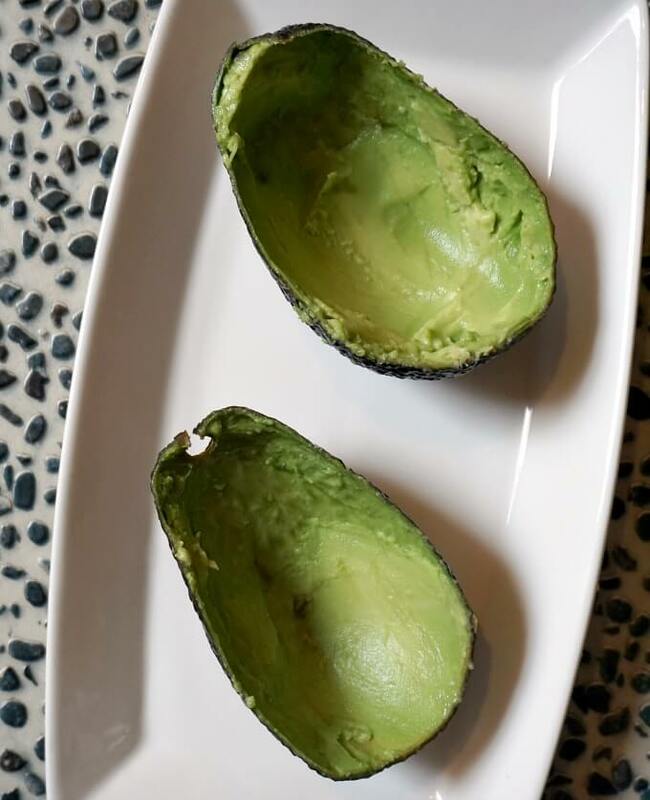 Now, you could of course serve the salad in an ordinary salad bowl, plate or whatever you want, but I find that the avocado skins make an excellent job here, and the salad looks even better this way. 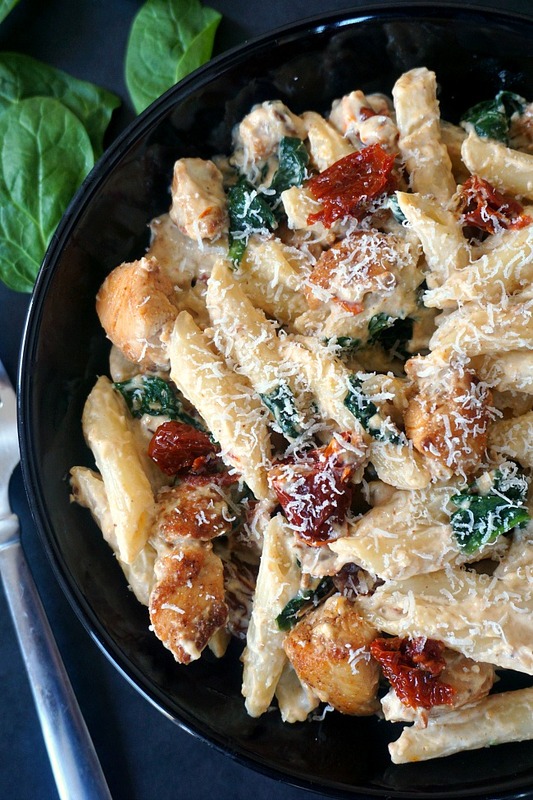 It makes it even extra yummy for some reason, don’t you think so? So, having said that the shrimp have to be cool before adding them to the salad, I should mention that the avocados should also be cold, you should ideally chill them in the fridge before using. If you don’t want to eat the salad straight away, I would use extra lemon juice, that will prevent the avocados from turning brown too quickly. Just pop the salad in the fridge and serve it when you are ready. But again, I wouldn’t leave it in there for too long. Salads, unless you go for a warm winter salad, should ideally be served as cold as possible,they are extra yummy and fresh this way. Or is it just me? Who knows! I don’t remember if I ever mention that parsley is by far my first choice when it comes to fresh herbs. It goes well with pretty much any dish in the world, and I tend to use it even in dishes that call for coriander (cilantro). They both have distinctive flavours, and corinder fanatics will strongly disagree with me, but let’s just say I’m not that keen on coriander. I mean, I do use it if I have a chance, and I admit it can totally transform a good old curry, but in salads, I can happily go for parsley instead. So, it’s totally up to you if you use parsley or coriander here, I’ll leave it to your own taste. And there you have, a super douper fantastic salad full of goodness, and so tasty. No one can possibly say that salad are boring, they can be as exciting as you want. Feel free to add anything else you like too. Lemon juice can be swapped for lime juice, in case you don’t have, we just need that nice tangy touch from a citrus. How nice! If you’ve liked my AVOCADO SHRIMP SALAD or any other recipe on the blog then don’t forget to rate the recipe and let me know how you got on in the comments below, I love hearing from you! You can also FOLLOW ME on FACEBOOK, INSTAGRAM and PINTEREST to see more delicious food and what I’m getting up to. 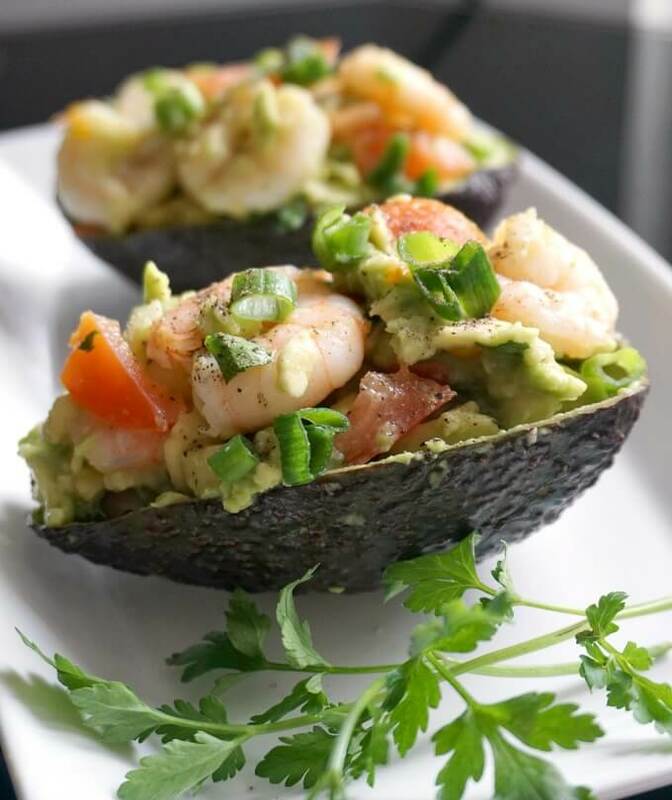 Avocado Shrimp Salad served in avocado skins, super healthy and delicious, ready in just about 10 minutes. 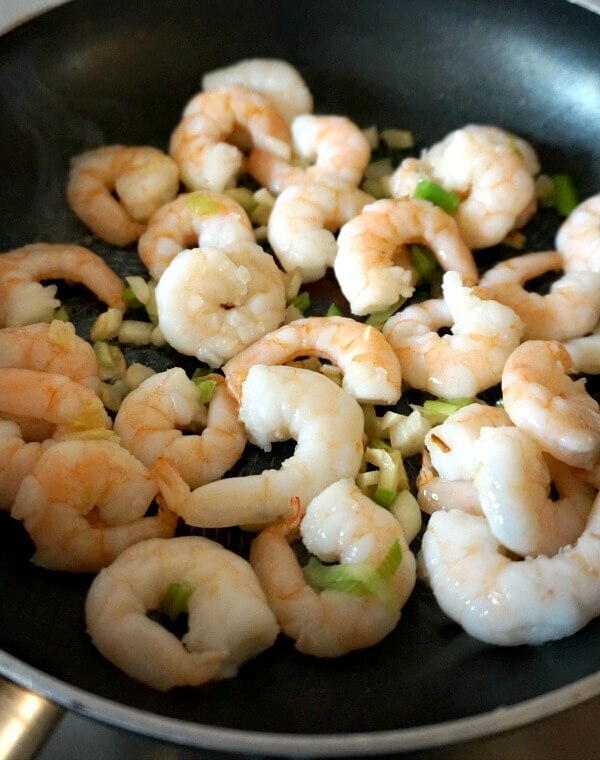 Heat up the oil in a pan, add the ginger, garlic and spring onion and stir for 10 seconds, then add the shrimp and stir fry for about 2-3 minutes until cooked through. Chop the tomato into small cubes. Cut the avocado in half, and use a spoon to scoop out the flesh. You can either cut it into small cubes or mash it slightly. Mix the chopped tomato with the chopped avocado, add the shrimp, salt, pepper and lemon juice and mix well. 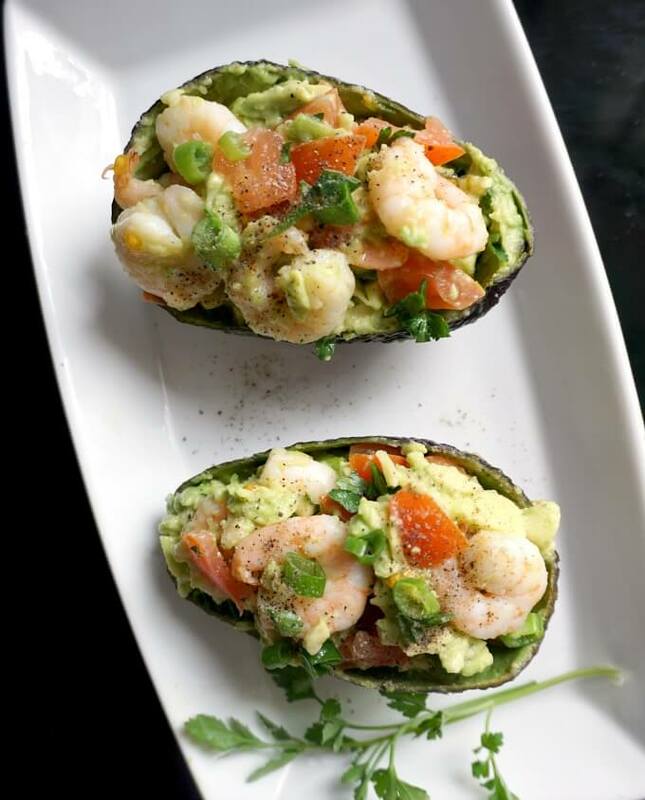 Fill the avocado skins with the salad, then garnish with freshly chopped parsley or coriander. Thank you, those pictures made my day. I’m going to do a bong hit and make it right now. Thank you, hope you will like!